SEATTLE (AP) — A Boeing 787 with a redesigned battery system made a 2-hour test flight on Monday, and the company said the event "went according to plan." The test flight was an important step in Boeing Co.'s plan to convince safety regulators to let airlines resume using the plane, which the company calls the Dreamliner. Boeing will analyze information from the flight and prepare for another flight — using the same plane — to demonstrate the 787's performance to the Federal Aviation Administration, said company spokesman Marc Birtel. The timing of that demonstration flight has not been set, Birtel said. Boeing hopes to get 787s flying again within weeks, not months, but that decision will be made by aviation regulators in the U.S., Japan and elsewhere. Worldwide, airlines own about 50 Dreamliners. The fleet has been grounded since January after lithium-ion batteries aboard two planes overheated. The battery on a Japan Airlines 787 caught fire after it landed in Boston, and the battery on an All Nippon Airways jet began smoking during a flight in Japan, forcing an emergency landing. Boeing added insulation around battery cells and a steel casing on the outside to prevent fires. Company officials have said that they might never know the cause of the smoldering batteries. The U.S. National Transportation Safety Board and Japanese authorities are investigating the incidents. The NTSB plans to hold a forum next month in Washington on the use of lithium-ion batteries in transportation. The agency said Monday that the event April 11-12 will focus on design and performance of the batteries and regulation of their manufacturing and use. 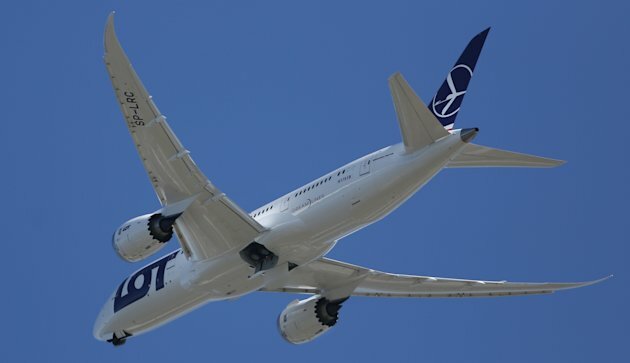 For Monday's test flight, Boeing used a 787 that it built for LOT Polish Airlines. The plane took off about an hour later than planned from Paine Field near Seattle, flew out over the Pacific and down the coast to Oregon before returning to the same airfield. Birtel, the Boeing spokesman, said the plane's 6-member crew tested landing gear, electrical and backup systems to show that all of them functioned as designed. The same plane had a similar test flight in January, but that was before the changes to the battery system. Boeing declined to provide access to the plane or its facilities before or after the flight. Shares of Chicago-based Boeing rose 3 cents to close at $84.85.